This work seeks to develop a new concept with which to analyse the actions and activities of states that tend to be relatively ignored by the discipline of International Relations (IR). As a discipline, IR has a tendency to lean towards the analytically safe. Given the current and recent dynamism of the international system that is both surprising and undesirable. 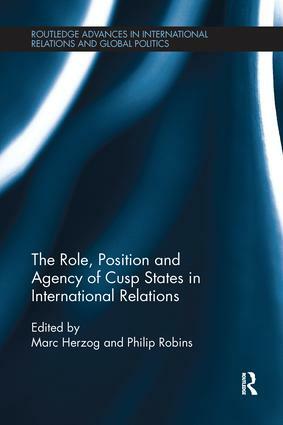 Arranged around the concept of the idea of the Cusp State (and cuspness more generally), the book consists of empirical analysis of eight different countries Brazil, Iran, Israel, Japan, Mexico, Taiwan, Turkey and Ukraine, defined as ‘states that lie uneasily on the political and/or normative edge of what is widely believed to be an established region’. By focusing on the importance of comparing groups of states, like states with high degrees of ‘cuspness’, this book argues that it is possible to categorise the world in a fresher and more original way, and one which covers more of the globe than either a systemic or regionalist approach would do. This work will be of great interest to students and scholars of Geopolitics, International Security and Regionalism. Whither spatial boundaries in East Asia?